D.J. 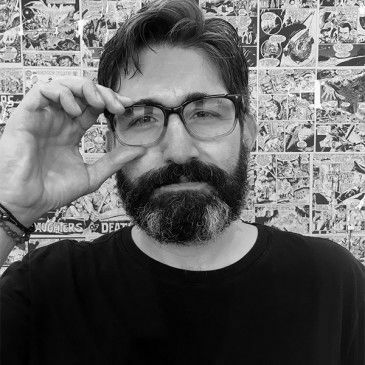 Kirkbride got his start in comics as an editor and writer on Image's Eisner and Harvey Award-winning POPGUN anthologies. After those, he co-wrote the acclaimed fantasy series Amelia Cole, which was part of the Monkeybrain Comics digital launch on ComiXology, published in print by IDW. Kirkbride is also the author of the cosmic space opera The Bigger Bang and its sequel, The Biggest Bang, also published by IDW. He co-wrote a modern reimagining of the King Arthur saga called The Once and Future Queen, the superhero drama Never Ending, and the DHP rock 'n roll action feature “Laser Joan and the Rayguns,” all published by Dark Horse Comics. His latest comic book is the sci-fi adventure series ERRAND BOYS for Image Comics.